I’d always wanted to try this but finding the right fresh veg at the right time in the UK wasn’t that easy nearly 30 years ago when we embarked on vegetarianism. 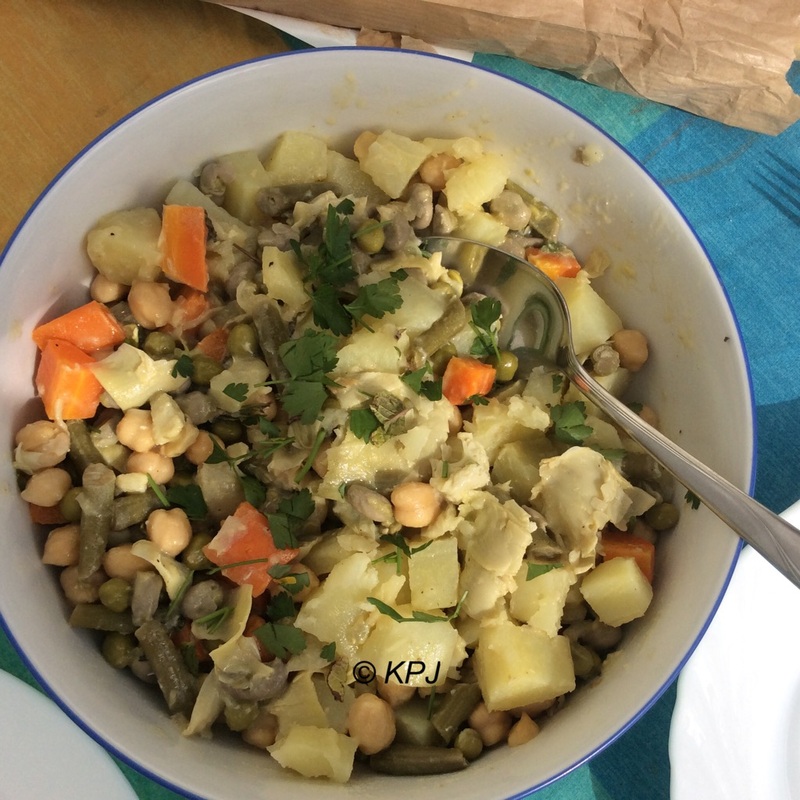 The pulses are chick peas, and the veg are potatoes, carrots, broad beans, French beans and (tinned) artichoke hearts. I decided to add fresh peas to the beans to pad it out, and I had them in. Elliot cooks the pots and carrots first and adds the beans towards the end. 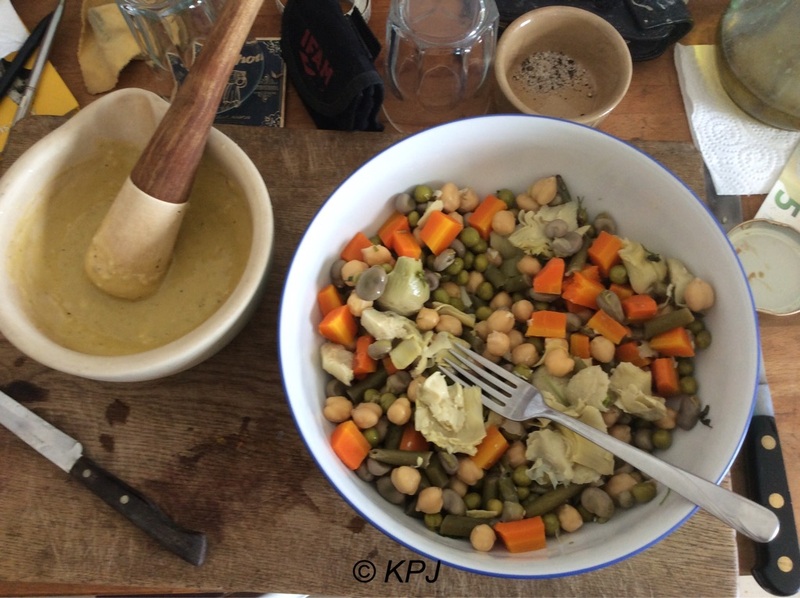 I cooked peas and beans first, and carrot and potato separately. Easier to gauge and saves discolouring the potatoes. Cook potatoes and carrots in large pieces and chop them later, keeps them firm. Add all cooled veg together, plus sliced artichoke hearts. Make dressing. Elliot uses a blender mayonnaise of one egg yolk, oil, lemon juice, wine vinegar, garlic, s&p, dry mustard, boiling water, and then adds yoghurt to the dressing. I ground salt and pepper in the mortar, added garlic, and then Dijon mustard. I added extra virgin olive oil by degrees (more than drops, but not all at once), plus lemon juice and wine vinegar. I also put off-the-boil water in the mustard jar, swirled it round and added some of that. 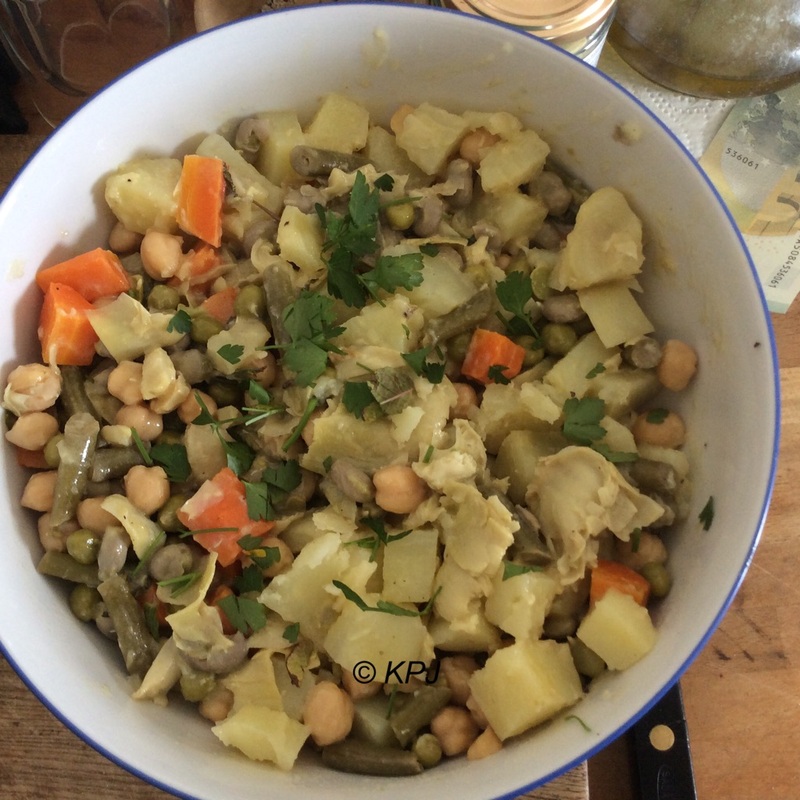 When the consistency and flavours are right, add to veg and toss/stir round. Add parsley or fresh herbs of choice. Serve outside in the sun with hearty crusty bread. I added an avocado to the leftovers for another lunch, and served it with a small salad and more bread.